Richard III had many enemies. Though the House of Lancaster had been extinguished, the Lancastrian sympathisers survived, who now rallied behind Henry Tudor, a descendant of the Beauforts, a legitimized branch of the House of Lancaster. Moreover, the family of Edward IV, and the Edwardian loyalists, were naturally opposed to him, essentially dividing his Yorkist power base. A coup attempt failed in late 1483, but in 1485 Richard met Henry Tudor at the battle of Bosworth Field. During the battle, some of Richard's important supporters switched sides or withheld their retainers from the field. Richard himself was killed. 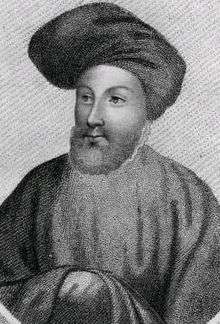 He was the last of the Plantagenet kings, as well as the last English king to die in battle. ↑ "House of York". 1911Encyclopedia.org. Retrieved 4 October 2007. ↑ "Channel 4 website devoted to "Britain's Real Monarch"". 3 January 2004. 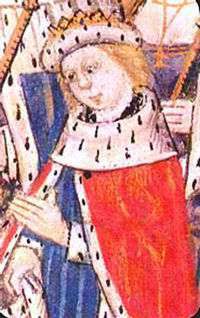 1 2 3 4 Edward was briefly deposed during his reign by Henry VI. Lundy, Darryl. "thePeerage.com - Person Page 10164". Retrieved 25 October 2007. 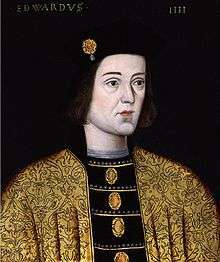 1 2 Edward V was deposed by Richard III, who usurped the throne on the grounds that Edward was illegitimate. "EDWARD V - Archontology.org". Retrieved 25 October 2007. ↑ Lundy, Darryl. "thePeerage.com - Person Page 10165". Retrieved 25 October 2007. 1 2 3 Lundy, Darryl. "thePeerage.com - Person Page 10163". Retrieved 25 October 2007.